Here’s some BME boy appreciation for you. 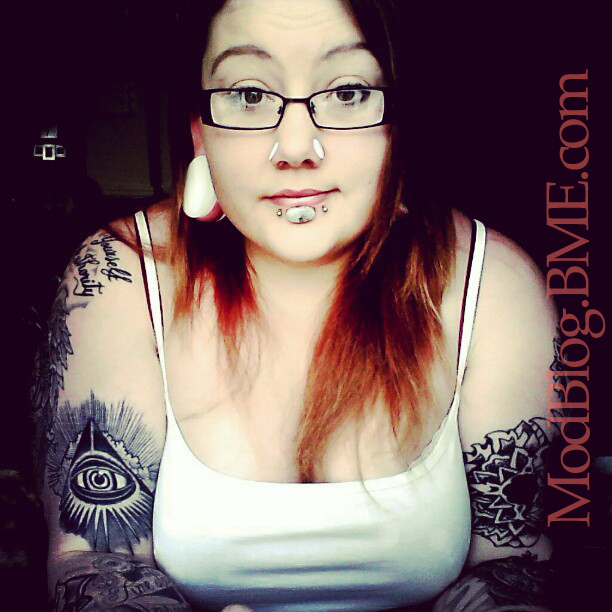 I love when people submit portraits of themselves to BME. TheTrueStasis sent us the following portrait. I’m not sure, but I think this might be “Blue Steel”. 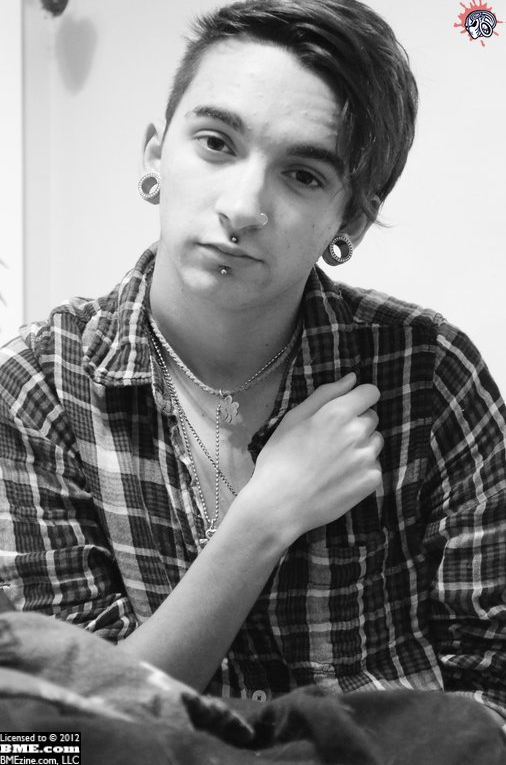 I like the choices and placement of his piercings, they have a certain flow about them. 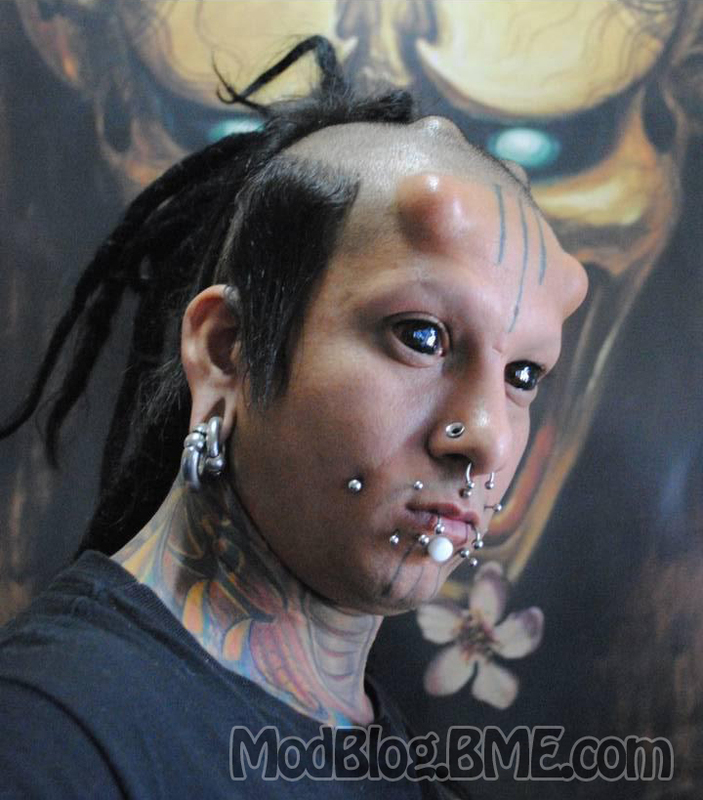 Send in portrait shots of you and your body modification! Remember, there are two ways to submit, either by uploading photos to BME directly through your BME account or via email. If it were not for his very modern looking glasses, I might be doing my best right now to convince you that Peter Csirmaz got his piercings in the late 1800s or something. Unfortunately I’m just not that good at photoshopping… Zoom in if you can’t tell by the pixels. Everybody has seen fun pictures of people showing off their teeth through the holes of immense labrets. Now, that’s a great goofy trick if you’re happy with your megalabret and are pleased to pop it back in after the gag photo is snapped, but it’s not so great if you wish you didn’t have that gaping hole in your lip. To refresh your memory as to what I’m talking about, here’s a funny picture of Jared Karnes showing what he does “when people are already being overly dramatic about it” — although most of the time if he’s not wearing jewelry you can barely see the hole, as you can see from the subtle slit on the left side of the image. Luckily closing these big labrets is not a complex matter as long as the lip has not been stretched dramatically (which would make it more like the reconstruction of a stretched lobe and would almost certainly require a complicated surgery). Here’s one done by Roni Lachowicz, showing the “before” photo, a picture a week later after the stitches were removed, and a fully healed photo a few months later. Since many people naturally have a scar in that location without ever having had a piercing (can someone explain to me why? ), it’s unlikely to make much of an impression, especially if hidden under facial hair. Zoom it of course (and most of the other images too). Speaking of Roni, it’s been a little while since I’ve posted one of the industry’s most striking individuals, so let me give you some eye candy. If memory serves, her eye tattoos are self done, which always impresses the hell out of me. Which reminds me that I should mention that my eye hurts a lot today. I have a bad headache, brought on by central apnea most likely, but it’s manifesting with a great deal of eye pain. I don’t know if it’s real or psychosomatic, but it’s something worth being aware of — real or not, people considering eye tattoos should be aware that even five years later, it can still ache badly from time to time! And finally — and I know I have really started to drift away from my original subject — I wanted to share one more piece of Roni’s recent work, a great looking tiny little star implant on the flat of the ear. It’s about two weeks old in this photo, so you can see a bit of dry skin over the incision. If this picture was taken even a few days later, you’d have no idea how this implant was inserted, because the incision is so nicely tucked underneath the fold of the helix. Any landing you can walk away from is a good one right? On the plus side, an eye patch will make her look like a pirate. You might not recognize her, but that’s IAM: IntoXiKate in a photo shoot she did with NuStudio back in July. Not only is Adhara one of my favorite BMEGirls, but she’s also a skilled belly dancer. Perhaps you have always wondered how burly masculine fellows can stomach getting an off-centre upper lip labret piercing, since all their proper names are girlie — “Monroe”, “Madonna”, or the largely archaic “Chrome Crawford”. Adam Richins of Warlock’s Tattoo and Body Piercing in North Carolina solved that problem when he did these on Brad Smith, starting nice and big and strong at lucky 7mm, and dubbing them MANROES. Works for me. But Adam, what were you thinking giving him PINK jewelry!?!? All that manly progress put at risk! PS. If you’re especially sharp-eyed, you can see Brad’s original off-centre lower labrets, which were also large gauge. John Garcia of High Class Tattoo and Body Modification in Fresno, California has done something quite interesting for this client that is wearing a large black labret. 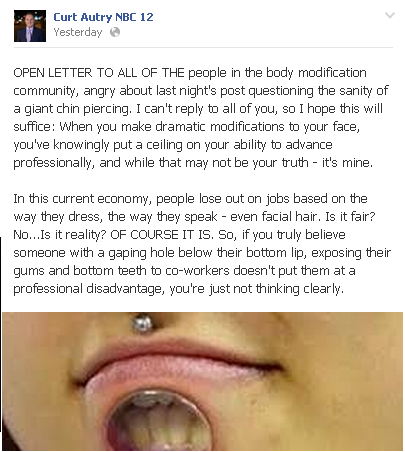 Using microdermals and caps that closely match the look of the labret, he’s created a staggered series of mods running from lip to chin that are probably quite a head-scratcher for anyone that sees it that isn’t quite familiar with the way body modification works. The procedure in and of itself is nothing special, but the way he’s utilized it is very clever and has given the client a unique result that I’m sure he’s very happy with. I wanted to show one other interesting application from the portfolio of John Garcia. Another client came to him with a large scar on his neck, and John pierced across it three times using surface bars with flat disc beads. 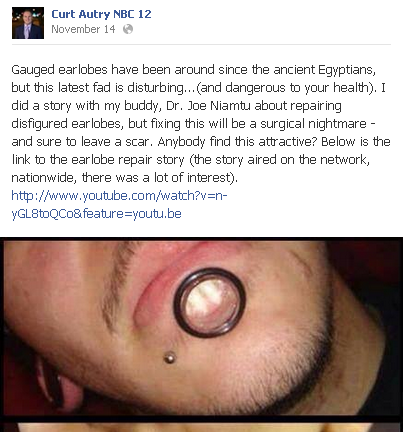 I get a kick out of this because it’s again the sort of thing that plays head games with people who aren’t intimately acquainted with body piercing — and in this case, I see them assuming what they’re looking at was done for the client at a hospital as a part of saving his life (like pins holding together a broken limb), rather than a piercing.